Besides storing photos and other files, Dropbox offers a simple and good solution to share photos with family and friends. However, how to share your photos in slideshow with music and transitions and other effects. It sounds a more interesting way to share photos slideshow instead of still shots. Unlike Picasa, Dropbox itself can not turn photos into a slideshow. It just showcases photos one by one. So you need to rely on a third party app to create a slideshow with your photos, then upload it to Dropbox and share it with friends. Want to have a try? Before we get started, please make sure that you have a Dropbox account. Photo Slideshow Director HD is a simple and fantastic iPad slideshow app which enables you to create a slideshow with iPad photos and Web Album photos, such as Facebook, Picasa , Dropbox. Then upload a finished slideshow to Dropbox directly. 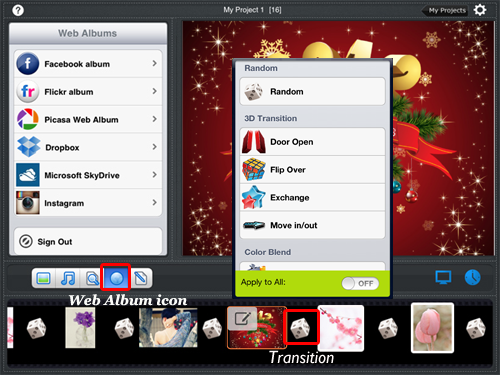 Import photos from iPad Photo Library or web albums, including Facebook, Picasa, Flickr, Instagram, Dropbox and SkyDrive. Then add background music. To keep music and slides play in pace, you can use its music and slides synchronization option. Regarding transitions, the slideshow software will automatically apply random transitions between photos. Actually the transitions are beautiful. However if you like, you can tap the transition icon(like a dice) between photo thumbnails at the bottom of the screen to change them.Then you can customize pan&zoom effects, choose a slideshow theme, add subtitles and text, set slides and transitions time, and etc. Also you can use its powerful photo editor to optimize photos. In a word, this iPad slideshow app has all the features to create a satisfying and attractive slideshow videos. With Photo Slideshow Director HD, you have finished a perfect slideshow. Then you just need upload the slideshow to Dropbox. Tap the “Export” option , you can see a list of available sharing options supported, including playing slideshow on HDTV, upload slideshow to Facebook, YouTube, Dropbox and SkyDrive. Also you can wireless transfer a slideshow to computer. Choose Dropbox from sharing options, then enter title and descriptions for slideshow, choose video resolution, and enter your Dropbox information to sign in. 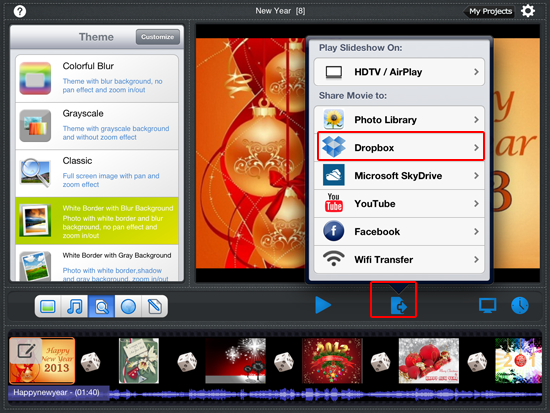 After that, the app will encode the slideshow video and publish it to your Dropbox account. Now the slideshow has been published to your Dropbox account as a video. You can share the slideshow to friends via email, Facebook or Twitter. Locate the file and Click the Link icon on its right side and Click Share Link. A small new window will show up displaying share options available, including email, Facebook and Twitter. Click Email icon and enter emails you want to send, enter messages, then Click Send. The slideshow will be shared via email to your friends. And your friends will get a link of the slideshow, they can view it when clicking the link. Click Facebook and Twitter icon to share the slideshow to Facebook and Twitter easily.